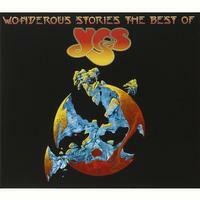 I’m sure some would make the argument that we don’t need another Yes compilation album. Well, as a Yes fanatic who has to own everything from Yes, I would disagree, at least in my case. This one has an intriguing choice of songs. All of the Close to the Edge album is represented. There are two epics, the title track to Close to the Edge being one of those. A couple unusual cuts included the shorten “Soon” and the acapella version of “Leave It.” All in all, this is a good collection. I’ve already reviewed all these songs in my reviews of other Yes albums. For the sake of consistency, I’ve used those track reviews here. Steve Howe screams out the intro to this one, foreshadowing it as a frantic and hard rocking Yes jam. There aren't a lot of wholesale changes here, but each member of the band works towards smaller change ups, adding a vitality and freshness as the cut moves on. This has always been a personal favorite of mine, and Howe contributes some of his most frantic and high energy guitar work of any Yes song. A Steve Howe solo piece, this is a thoughtful and evocative acoustic guitar excursion. With a subdued keyboard segment starting the cut, pipe organ blasts in. It is followed quickly by the rest of the instruments. This piece is hard rocking prog that features some wonderful bass moments. Here we get a rendition of the song sans instrumentation. I remember this was one of a series of variant “Leave It” videos on MTV. Since the vocals were such a big part of this to begin with, it should be no surprise that it works quite well like this. A pretty and sedate melody begins this. Anderson's vocals add a verse that feels like a chant, Squire adding his voice alongside. As the next vocal segment, a soaring and powerful one, comes in atop the same backdrop, Wakeman's keys and Squire's bass occasionally shadow the vocal line. This section pulls most of its power and direction from the vocals, the instruments seeming to follow Anderson, changing their melodies essentially to better accompany his performance. After a time this drops to a mysterious instrumental passage, but it isn't content to sit there long, instead moving back to the same place it came from. A new, bouncy melody takes over providing the new backdrop for the vocal arrangement. This carries the piece for a time then moves through several changes before giving way to another dramatic instrumental interlude. A new melody line comes out after this segment, this a catchy and bounce movement and one of the more effective verse segments on show here. Chris Squire's bass provides the majority of the structure for this. As this movement ends, a new instrumental segment takes the piece, then a fast paced prog chorus with Chris Squire laying down a killer almost funky bass beat takes it. This again doesn't overstay it's welcome, dropping to a pretty mellower section that then gives way to a bouncy acoustic guitar melody that serves as the backing for the next verse. A vocal segment from earlier in the piece eventually re-emerges, and the group reworks this into a glorious instrumental excursion before slowing it down for another vocal performance. This one is abase on a jumpy sort of rhythmic patter. It eventually gives way to a rather awesome keyboard solo based movement. The band reworks this as the3y recreate and embellish the them. A new progression comes out of this one and forms the backdrop for the next section. As they work out beyond this, Howe gets in some meaty soloing before the next verse and again after it. This drops down to the more sedate after this resolves out. Wakeman weaves melody lines over top of his own accompaniment to end the piece. Keys start this, and while Howe lays down a bouncy Police like rhythm guitar Squire's bass simply runs like crazy. This is definitely not your typical Yes music, but Squire and Howe are both on fire at times, and the general tone and quirky changes really do work.